It’s what pets walk on, and occasionally it’s what they soil. While there are some tradeoffs with looks and function, there are a few choices that offer both good looks and clean-ability. Linoleum has been around for more than 150 years — likely because it’s one of the most durable, cleanable surfaces. What began as a patented mixture of linseed oil, cork dust and wood “flour” has long protected battleship decks and hospital corridors. But linoleum has moved beyond the institutional. Premium stuff, like Forbo’s Marmoleum and Armstrong’s Marmorette, offer traditional durability in a wide variety of colorful patterns for modern homes. Because it’s made from both renewable resources and recycled content it can be “green” without being green. There’s also Kährs flooring, which interlocks like laminate but offers sealed layers of wood that can be sanded and re-finished if needed. Also known for their toughness, laminate floors can be noisy, Rouza warns. For natural wood floors that are still pet-friendly, bamboo wins points with Rouza for its durability. Cork, though a softer wood, can recover from small scratches because of its natural oils. 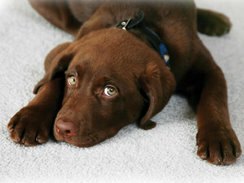 A perfect companion for carpet, hardwood or tile, “rugs are a great thing to have,” says Rouza. Whether it’s highly patterned Persian or even contemporary geometric-patterned rugs, their usefulness knows no bounds. Like carpet, rugs with a busy pattern hide stains better than solid colors. Specifically, look for rugs made from 100% wool. “They are easier to clean because of the natural oils,” Rouza says. To do their job, rugs need to be placed strategically. Rouza keeps an indoor/outdoor mat inside the back door. Just large enough for her dog to hit with two strides on its way in, it does a great job cutting down tracked-in dirt. Pets can’t see as many colors as their humans, but the trade-off is that they are much more sensitive to smells. It’s a fact we olfactory-challenged humans sometimes forget, but even after the fresh-paint smell is gone, paints still emit chemicals into the air. Because the fumes stay closer to the ground, “pets and kids are more susceptible to the fumes from paints,” Rouza explains. She recommends choosing a low- or no-volatile organic compound (VOC) line. For decorators who want the look of matte paint but the pet-friendly wash-ability of glossy, Rouza recommends Benjamin Moore’s Aura washable matte line. Benjamin Moore also makes the Aura Bath and Spa line that, with its easy wash-ability and mildew resistant coating, is perfect for the Northwest. When it comes to upholstery, a cotton slipcover is the option that’s by far easiest to clean. However, if you want the good looks of a traditionally upholstered living room set, the best fabric is chenille, according to Rouza. This versatile fabric comes in many different colors and patterns, and even the slightest pattern helps hide stains and imperfections. 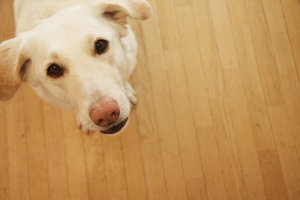 Durable and easy to clean, chenille can attract pet hair, Rouza warns. “But it depends on the type of chenille,” she continues. “Generally you want to get as tight of a weave as possible. When you look at it, it’s not big loops and big stitches.” Also, an open, loose weave can snag on paws and claws. Leather upholstery doesn’t attract pet hair like fabrics, and if it’s good-quality leather, stained all the way through, it won’t show minor scratches. For those who want the clean-ability of leather without the price, there’s microfiber, a man-made suede-like material that can be cleaned with just soap and water. Cotton, chenille, leather or microfiber, the busier the pattern the easier it is for the upholstery to disguise stains and blemishes. Cats are notoriously hard on fabrics, blinds, and just about anything that hangs, dangles, or feels like it should be scratched. They are also notoriously hard to predict. Rouza has an interesting approach to their capricious preference: a scratch test. When it comes time to pick a fabric, bring home several swatch samples or carpet remnants. Leave them in a place where your cat is likely to feel the need to do a little claw sharpening. For the house, choose the fabric or carpet that isn’t up to your cat's high sharpening standards. But also order some of the “winning” material and turn it into a designated scratching accessory. Cats also like to play with precariously balanced items. Sometimes that’s their favorite mouse. Sometimes that’s their parents’ priceless heirloom. Rouza’s secret trick is museum putty. With a strategically placed dab of putty, dislodging heirlooms becomes a chore, and a prowling feline will usually find something easier to play with. The other issue for cats is their litter box. It’s always better, for human aesthetics and bashful felines, to have the litter box tucked away in a closet or utility room. As a designer, Rouza mentioned Tidy Cats Breeze litter box — which uses litter for solid waste and a pad for urine — as an example of how far technology has come in reducing the smells and inconvenience of traditional litter boxes. Posted in Life with Pets. August 1, 2010 by Jake Faris - Spot Magazine.